We have been absolutely hammered this month, making up for all of last year too. 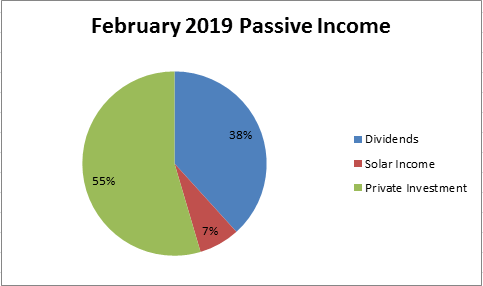 On the income side of things, February was great with so many dividend raises. 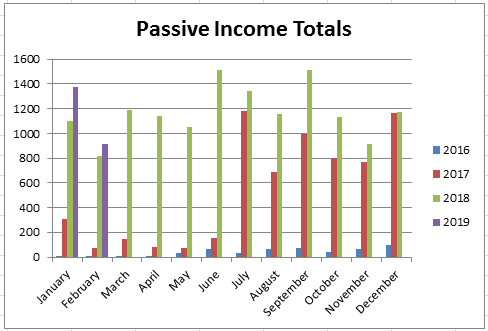 Total Passive Income Increase over last year - 11.95%. Luckily, it's March now. (That even feels good typing it out) The weather will start getting warmer and we can migrate back outside. February was a pretty good month. Our son had his birthday and that was a relatively small event (think 40 people) at a kid's indoor playground and arcade. I did some ice fishing with a couple of buddies of mine, busted out the GTs with the kids and did some tobogganing. On the income side of things, February was great with oh so many dividend raises. Let's Get to that Income. This may be a record month for me with all these dividend raises. This added $12.14 to our forward income. In total, these 6 raises added $78.60 to our income. Sweeeet! 7 Drips this month. Not bad, but one of our lower months for sure. Our Drips (Dividend Reinvestment Program) added $8.69 to our yearly forward dividends this month. Got to love seeing these purple lines, growing and growing. March will be an interesting month as I switched up so much of our Enbridge position. Not a bad growth rate overall. The solar was up $20, but other than that, the growth was just dividend income. This month, we added to our position in Inter Pipeline. This purchase now creates a monthly drip of the company moving forward. I want to read 10 books this year. I started another social media book and got bored of it. So I started reading a new book on real estate investing. 0 books finished this month, so I'm still 1/10. Get A Will - We made our Wills this month! So Pass. Picked up some Garbage - Still too much snow, so no progress here. Charities - I emailed a couple of charities about a bigger donation but didn't hear anything back. Time to sign up for something. Increase Dividends by $1,100 this year. With New Purchases, Drips and Dividend Raises this month we added $215.33 to our dividend Portfolio. Between January and February, we have added $311.82 total. 28.74% of our goal. Reduce Screen Time before Bed - This month I really fell off the wagon on this front. Needs Improvement. The market has continued to pop up and has increased our net worth by quite a bit, but makes the buys a little harder. We don't try to time the market though and continue to just throw cash into good companies at fair value. 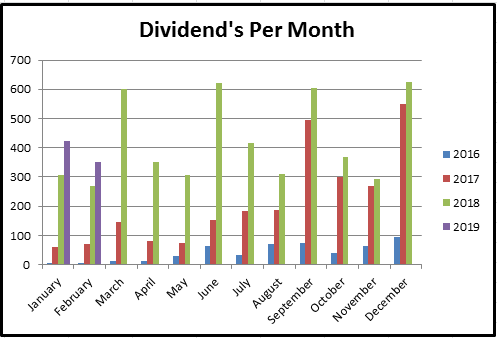 It's great to see the dividend growth rate year over year this high on these months, as they are my lowest months. Got to love that new AbbVie addition! Dividend Raises were quite substantial this month and really point out that I should eliminate these non-dividend raisers in the not too distant future to let the power of dividend growth investing work faster. It was a fantastic month all across the board. No complaints here. How was your month? Did you set some new records?